What a pleasant surprise it was when I opened the big envelope stamped with foreign stamps! 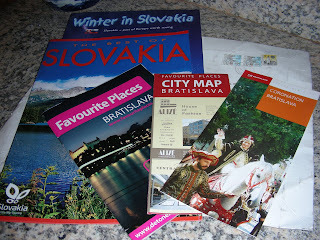 Included are maps of Bratislava and other travel info of Slovakia. European culture has interested me a great deal, as much as Chinese culture. Fascinating architectures and arts, life style, cuisines. There is a certain romantic notion of being there, as least for a visitor. Through out my blog life, I have tried various angle/lighting/setting to capture the best representation of tea. Some times trying too hard with too much shifted the purpose. Pictures might come out nice, but the tea is not identifiable. Dry leaves in picture is taken under natural sun light. I have only 30 minutes window to take pictures each day, that's only if I wasn't busy with other things and the sun is out. Due to sun light only shine through my door about 2 feet. Following picture is spent leaves in a shallow dish filled with water. The clarity level is high enough to show veins and other details detectable by eyes. Flash light was used here, a bit over exposed, however all 3 dimensions are visible. Water keeps leaves semi floating which creates a 3 dimensional look, unlike wet leaves lay flat on surface. These Lao Ban Zhang bricks are almost 2 years old now. They were stored in my home for most of the time, in a card board box in a cool temperature room. Moisture variation is seasonal, but never too low. Nine months ago, I transported them to my shop in PV, moisture is much higher here all year round. Upper brick is stored on shelf (dark) with only paper wrapping. Brick is fluffy and leaves are easy to pick out. Lower brick is stored in a porcelain box. Brick is still compact and solid. After a tasting session, upper brick obviously aged faster than the lower, color is darker as well. However I like the taste of the lower brick better, it's more refined, less "rushed". 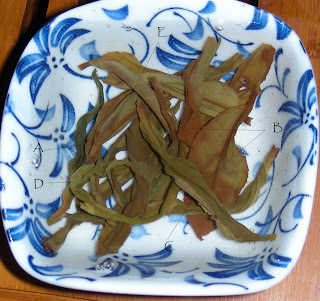 In picture below is Zhi Lan Xiang Ping Jai Tou, spent leaves after god knows how many brews. As you can tell, leaves are uneven by shape, color and fermentation. Spent leaves show all the tell tail signs of quality. A. Does not belong here, a much darker green leaf some how got into this bag. Most likely a Big Dark Leaf from a container next to the Zhi Lan Xiang fell over. It happens and often at tea shops or factories. As long as the ratio is low (usually only a few leaves), it does not make a difference. B. Bruises, these are not fermentation color change. Bruises are created during fermentation process, tossing leaves too hard breaking leaves in the middle which cause fermentation in the middle of a leaf. A few of these in a cup will cause astringency. Take a step back, ocean becomes bigger, sky becomes wider! Every now and then, or should it be more than often, one must attempt to perceive life from a distance. Tonight, this ancient wisdom struck me to the core. In a previous post, my focus was in tea and tea alone. Tea is my life, my center, my world along with my family and friends. But I was caught up in how tea prices and current economy will effect the livelihood of my business, that I was oblivious to the aftermath of the snow storm affecting those whom live there. Millions of people lost their crops, fruit trees, houses, resources of future income for the coming months and years, and even their own lives. You don't see you don't feel. How insensitive I was! My problems are not problems in a big scheme of universe. Hu Nan province is one of the area, perhaps the worst affected province by this brutal and unforgiving snow storm. Power was out for more than 2 weeks. Millions people lived in the dark or trapped in remote areas where food and heating materials were scarce. Electricians work around the clock to fix towers and power lines both in cities and mountains. They work an average of 16 hours per day. Groups of 6 to 8 people walked on foot in the mountains over night to track power line/tower failures. Only return to the office for a hot cup of instant noodles in the morning. Upon leaving for the mountain before dark, no one can predict if everyone could come back alive the next morning. Over worked in cold dark icy conditions and in hunger, these are the modern day heroes truly devoted to their country and its people in times like this. To the family members of those fallen heroes, this snow storm is not lovely snow flakes drifting romantically, magically, but the sky - their world collapsed upon them. The wives, children, parents, brothers and sisters lost their loved ones, their source of reliability. How could this be real, many of them asked. At times as such, it reminds me how fortunate I am to have nice warm bed to sleep on, food is abundant, loved ones are around and well, on top of all, I have a good cup of tea in my hand. What luxury that is! Thank you lord! Wish all will be well again soon in China! China is a nation of uncrushable spirits! Chao Zhou Kung Fu Tea is the oldest tea culture even in China. Tea wares are some what different as well. Most of the modern day Kung Fu tea wares (except YiXing) are more or less derived from the Chao Zhou style. Pictured below is a typical setting of traditional Chao Zhou style, minus the mat. This is the traditional method, and still practice by many locals. However water drops everywhere, number of cups are fixed no mater how many people are there in the party, which isn't as practical as other tea trays and tea sets on the market. Phoenix teas are more aromatic than most teas, hence temperature is extremely important, especially for 1st brews. That's why the preheat water is only emptied right before tea is ready to be poured, also Cha Hai is not part of this method. Rinsing is not recommended for high end Dan Congs. Oolong teas go through series of rolling process, hence much of the juice is on the surface of the leaves, rinsing is throwing away the essence. Traditional CZ tea wares can be made of CZ zhu ni, ceramic or porcelain. You can mix and match any dishes to create a set which is what I did in the picture, as long as the size is right, functional and pretty. Enjoy your Dan Cong tea! It's not good news for any of us, tea drinkers, tea merchants, and tea farmers. Snow storm wiped out 30% of the tea farms in China. 10% tea trees are frozen to death. Green tea productions will be delayed by almost a month. First crop will be on market by mid March, where previous years first crop were available shortly after Chinese New Year, right about now. Prices are expected to go up 30% for Spring 2008. Current market is made up by last year stock, price has already gone up 30% as well for last years crop. 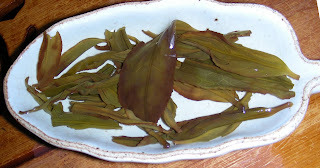 However, quality of 2008 Spring teas are expected to be higher. There's at least one thing to look forward to. Consumers have many choices: pay more for quality teas, pay the same and drink less quality teas, switch to Indian, Ceylon, African or herbal teas, drink less tea or stop drinking tea. Tea farmers will raise price to make up for lost productions. Tea merchants can raise prices, the consequence is fewer buyers. Keep prices low, the consequence is can we pay rent and expenses? US tea merchants: USD to RMB is down 40 cents in just 4 months, shipping is expensive, government departments are thieves, minimum wage went up in January, even supermarket prices have gone up 30% to 50%. China inflation rate is 7% for 2007, 2008 will get worse, USD at more than 1% depreciation rate per month, plus 30% higher price, I will have to stop drinking tea myself. Briefly roasting tea before brewing has been a practice since the Tang dynasty. However this form of art is lost in the main stream tea culture, but still practiced by minority groups in rual parts of China. There's a little bit of revival here and there today. This is a Chao Zhou method of pre-roasting utilizing what's on hand. 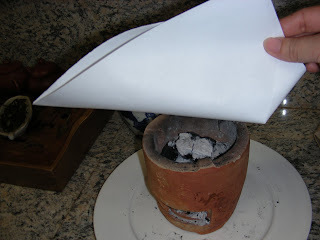 Paper made roasting platform/Cha He. 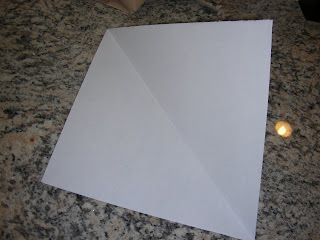 Use a 11"x8" clean white paper, fold as in picture blow. 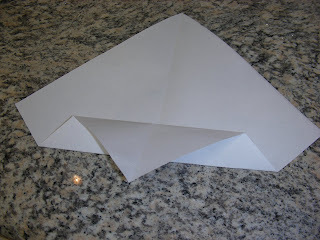 Cut off the excess trim, leaving a square piece of paper. 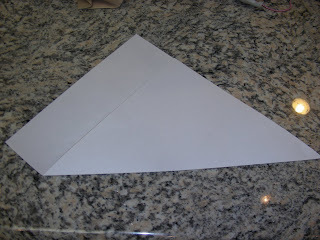 Fold one corner of the square with seam line up with seam, then fold part of the folded corner backwards, see picture below. 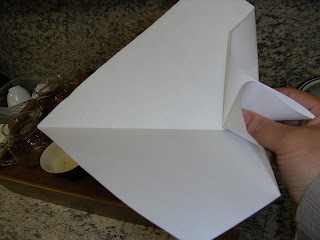 Fold paper in half again along seam, hold the "tail" with thumb and index finger as in picture below. Closing the top can keep the heat even and consistant within the Cha He. Finally, when the tea is ready, you can pour tea directly into teapot as a real Cha He. Whoa La! Have an aromatic and flavorful cup of tea! Dan Cong is such a wild child! A few reviews I have observed online mentioned the short lived aroma after 5 infusions. My first instinct was hmm, it can't be. I tried blaming it on water or what not. I then discovered a few Dan Cong behaved the same way when I made them myself which was long lasting a few months ago, it's now loosing it's strength. It's baffling to my curious mind. After hours of digging for information and phone calls to China, I found out this phenomenon is called Fan Chun (Returned Spring). It's actually quite common with oolong teas, wuyi, anxi, taiwan or Phoenix oolong. Weather play a major role in Fan3 Chun1, moisture in the air and low temperature are the keys to fluctuations in taste, for most agricultural products as mater of fact. This is rainy season in southern California, temperature is in low 60s F at high, low at low 50's even 40's for some area. Palos Verdes is humid year round with morning marine layers, this time of year is even more rainier. Fragrance of tea is "trapped", there isn't much you can do with normal brewing method. Well, the question is if this is permanent? No, it's easy to fix with a little roasting. Yes, it's an extra step, but if you are obsessed as I am, it's actually fun. I also have various types of tools to manifest the transformation, it does make it seem easy. However, I am going to show you the easiest way to roast without having to buy any additional tools. Who owns most of the aged tea? Pu-erh tea had many tea drinkers addicted to its aged, decomposed flavor. 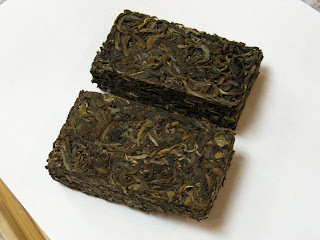 Other aged teas also got more notice, oolong has its share of followers, aged green teas surface here and there too. Who has the most stock of aged teas? Who has the financing and storage to hold and house teas for a long period of time? None other than China natural products import and export company, tea subsidiary, even today. Before privatization of tea manufacturers, communist party owned tea company house and control all tea productions via purchasing teas from local farmers. Farmers "sold" their productions to the government, some might leave a small quantity for their own collection. Majority of aged teas are still within control of the Tea subsidiary of local provinces. Only small quantity is available on the market. Aged teas by farmers can be either intentional or circumstantial, however majority of the teas own by the government are most likely aged circumstantially. In an hour of commute on a Saturday morning, thoughts came across my mind is nothing far from tea. Now that my tea shop's into its 9th month of operation, much of the tea related daily thoughts are inventory, tasting, who likes what tea, things I know and things I don't know about teas. This morning, my thoughts went a step further, if I were a tea leaf full of flavor and substance, what's my destination? The optimal result would be end up in a cup of hot water releasing all the flavor?! Meet the right water, wait for the right temperature and use the right utensils. Making a good cup of tea is some what like meeting the right person as a mate. If the water was good, tea flavor can be enhanced, on the other hand, a fare mannered girl can become bitchy. If the temperature was hot enough, the substance can be released, if too hot, the bitterness will also come out. On the other hand, flavor of tea will not be revealed, a fun persona could become boring. If the utensils were wrong, tea would be bland. On the other hand, the right utensils can magnify the good and round off the bad. The right persons can inspire one and other to learn, improve, progress, and excel. If I were a tea leaf, where is my water?! Chinese New Year was last week. We celebrated this holiday tradition with a tea party. Many guests arrived with festive spirit, some were dressed up in Chinese traditional clothes. It was a fabulous event. However I was too busy to take any pictures. Above picture was taken today before all holiday decorations were taken off. I did not get a chance to drink tea with the LATA gang, aged pu samples sent by Paul of Sacred Tea were supposed to be tasted with members, but we did not get to drink any. We will try to schedule the next meeting soon. Wish everyone a happy new year, may good tea fill every cup of yours in this new year! Cheers! Consumers are leaders of trend in tea, as in everything else in this world, be it fashion or life style. In recent days - less than 20 years, Qing Xiang (light fragrance) oolong has crept up market share to dominate in current market. Many old timer tea drinkers are complaining the new trend is digressing from the traditional. From an industrial point of view, producers will always make anything to meet market needs. You can roast all the tea you want in traditional roasting, and try as hard as you can to push for a sale, but if consumers do not buy, there is nothing you can do but to bend your wills. Tea producers and merchants have to make sales to make profits to put a roof over their head and take some bacon home to feed their wives and children. So why do most consumers prefer Qing Xiang teas? It has to do with drinking habits of the majority population. 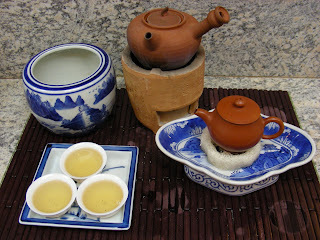 Oolong tea did not travel far into inland of China before modern transportation. Out of all the tea producing regions, Fujian and Guang Dong are small and limited with production. Most teas from the 2 regions were sold to foreign countries with seaports right at home. What do the rest of the country drink, even today? Green tea and flower scented teas! Habit is something you grow up accustom to, with little incentive or need to change. When oolong is not known or available, green tea drinking habit is unshakable. However, modern day trading is effective and fast, mobility of tea allows green tea drinkers to have a taste of oolong, pu-erh, liu an and even dajeeling in China. Habit is hard to change for many, green tea drinker will have a hard time adopting the taste of heavy roasted flavors. Facing a large market aim at green tea drinkers, either produce something lighter in flavor resembling green tea or leave that segment of market. As good business men that Chinese are, new products are created to meet the demand. There is nothing wrong with that. There are demands all across the spectrum of the roasting degree during any time space, now, then and later, just the mater of more or less. Even the concept of "new" for qing xiang is not new. 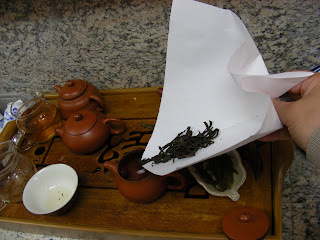 Combing through dozens Qing Xiang oolong to find one traditional roast is a chore I admit. But it's not extincted. Like searching for any good tea, it takes effort. There is always an other way to accomplish your goal, roast your own tea! This is actually much easier to achieve than finding fundamentally good quality tea - good raw materials to process into superior flavorful tea. Advantage of traditional roast: longer shelf life, more complex flavor and texture, suitable for aging, easy on stomach. Advantage of light roast: floral fragrance, easy to drink for green tea drinkers, shelf life is shorter but no longer an issue due to new economic power with more disposable income. Dan Cong can be rare due to its old age and limited production, but is it necessary better? Here are some of the distinctions between the old and the young. Under normal growing condition - low altitude with dramatic seasonal temperature changes, tea tree's live cycle peeks around 60 to 75 years old, then it starts to decline and die soon after. During this live cycle, early years is growing cycle, like a baby grows to expand limps, in the case of tea tree branches and root system. 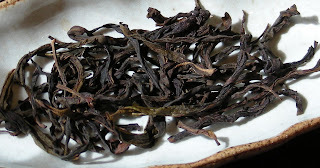 However young trees are fragile and weak, hence teas produced from young trees are thin and flat in taste and texture. As a tree grows into 20's and 30's, the tree is strong and vibrant, with sufficient fertilization, leaves are strong and meaty, production is high. At this stage, flavor starts to develop, but not complex. At age of 40 to 50's, tree is at its prime, production is high with complex flavor. At 60's and 70's, the flavor is most complex, however production declines. Flavor: Tannin is significantly more than older bushes, hence it can be bitter and astringent if brewed too long. Aroma is very up front, sure to give an impression. Texture is thin with sweet honey taste. Young and wild, beautiful and temperamental. Well made teas can last 7 to 10+ brews. Well made commercial teas have an even uniformed look due to production availability. Commercial teas are further separated by size according to grades. What preserves the longevity of a tea tree one may ask?! Slow growth in cool (not cold) climate with little direct sun ray. High altitude mountain sides facing south-east produce the best teas in the world. Tea trees are adaptable to shaded environment. High altitude mountains are covered with dense fog for many hours each day, providing moisture and nutrients to the leaves. Dense fog also block off direct sunlight yet allow ultra violet ray to penetrate the cloud layer that photo cells need to transform nutrients into energy. Without direct sunlight, temperature remains low until later in the day when fog layers are cleared. Trees on the south east side of the hill side does not get much direct sunlight even the fog layers are cleared. The hottest sunlight is in early afternoon, which is all over the other side of the hill. Leaves and branches grow slowly in this climate, at the same time root system develops fast with all the nutrients absorbed from the leaves. Big root system and slow growth mean lots nutrients are being stored in each leaf. Older the tree slower the growth. Flavor wise, aroma is less pronounced as younger trees, taste is complex with multiple layers. Each leaf contains 37% dissolvable substance, ranging 40 to 60+ chemicals by varietal, there is much to discover in your cup of phoenix tea! 20+ up to 35 brews is not uncommon. Its smooth, round texture and lingering after taste are signifier of old bush. Rich but introverted. Old bush teas are some what uneven in look, there are young leaves, matured (not old) leaves, rolled up or open, long whole leaves mixed with a few cut up ones. It contains everything harvested from the same tree without separation by grade. 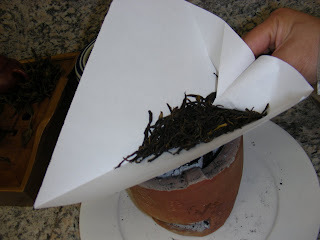 Because of this very practice, it further adds layers of complexity to the flavor of these old bush teas. Phoenix mountain is located in subtropical climate in southern China, lowest temperature does not exceed 5 degrees C. Most plants in the region are not dormant during winter. Phoenix tea trees produce tea all year round. Production begins around late march as official spring crop, April production is also spring production. May production can be either early summer production for low altitude farms, and still spring production for high altitude farms. June and July are summer productions. August can be either late summer for high altitude or early fall for low altitude. October is winter production. November to February productions is a blur, some times it's call winter-spring crop. Due to low production in fall, winter and early spring, farmers either mix everything together or skip production all together depending on the altitude and age of trees. Spring (April through Mid June). This is the only production of the year. Even though trees will still grow through out the year, growing rate is too slow to produce anything significant, flavor is also not good enough to command high price. Most farmers leave the trees alone to preserve nutrient. It's especially important for trees that are 200+ years old. Sorry for the lack of posting in the last couple weeks. Between Chinese New Year and getting ready for Valentine's Day inventory, training, tasting, paying tax, I got my hands full. It's been a while since the last Dan Cong topic. I'll work on the series later today. 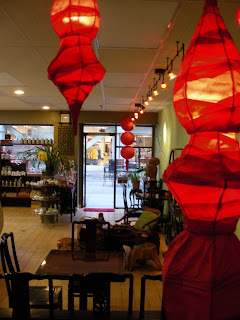 Tea for all in the new Lunar year! Sample pack of commercial DC for $8 including shipping in US, $12 to Europe. For those who place orders during Feb will receive this sample pack for free. Limit of 30 sets --- Sold Out. After a long 2 full months journey at sea, my Dan Cong teas made its way to me on Wednesday. My mailman Glen must be a little or very much annoyed by me, every week for the past month I'd asked him where is my tea, have you seen my tea, no tea, no tea still, tea today? Well, I would be annoyed if I were him. I am just glad my teas made it safe to me. What's in box?! Let's see.. Some how Mr. Gui's teas were substituted by Da Wu Ye and Da Yu Qi. Aiya! I have been really busy for the last week and this trend will continue into and after Chinese New Year. It's been overwhelming to taste so many teas in a short period of time. It sounds like I am complaining about drinking lots tea, especially when most of them are outstanding teas. But really, I can't keep up. Last week's tasting turned out to be a 3 drunken days event. I had to have a tea diet for a few days to sober up. So I'll have to update tasting notes gradually. I tried the 97 Honey Orchid and Da Wu Ye special grade today, Da Wu Ye stood out to me, however I wasn't focus enough to take notes. Zhi Lan Xiang is my favorite, as you can tell, I have quite a few Zhi Lan Xiang bushes (4). This is also a challenge to take tasting notes. While I can describe one tea drank at one seating, but without drinking them side by side, I have a hard time telling the difference except which one is better in general. 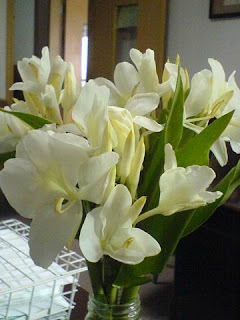 Dan Cong fragrances are mimics of other flowers. Some of the plants are not native to North America. Ginger flower is not quite the same as ones known here (Hawaii). If you happen to pass by a flower looks like this, make sure you take a good sniff, the aroma will amaze you, it's more than I can describe.